Okay, so a couple posts have shown up a little late lately. A little “after deadline,” shall we say? And maybe the dateline did not reflect the lateness of the post. Perhaps this blog is not the cornerstone of journalistic integrity? All I can say is I try to post as close to daily as possible to keep the blog fresh with content. And once in a while I may fall a little behind. But then once in a while the comment section gets a little scant. So how's about we give each other a little break, ay? While going around with my parents, I tried to speak Samoan as much as possible to play down the palagi tourist angle. Speaking Samoan at the flea market usually warranted a discount of $2 or $3 WST. Speaking Samoan to taxi drivers rarely made a difference. 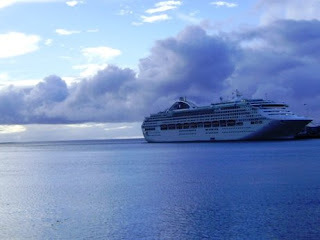 It made a huge difference today when a juggernaut of a cruise ship parked itself in Apia Harbour and I was able to differentiate my parents and me from the crazy palagis from the boat. As you may have noticed, I’ve been reading Jonathan Lethem’s “The Fortress of Solitude” for the past month, maybe even month and a half. I haven’t stopped updating the “Books I’ve Read” list, it’s just really taking me that long to get through the book. In fact, I’m only halfway done. What can I say? It’s a dense read, and I’m a slow reader. It’s pretty good though. Just long. I have finished grading all of my written exams from the exam week we had 2 weeks ago. I still need to enter them into the computer, and I still need to grade the Common Assessment Tests my year 12s took last week. I think I can have all of that done by Friday afternoon. That will be awesome. I have terrible luck with cameras in this country. It’s a foreign country, and the candy produced here is made with real sugar rather than high fructose corn syrup. There is little variation in the food we eat here, so treats like chocolate and candy are extra good. The tastes reminds us of home. With all the heat and humidity, the body reacts well to stimulants (like sugar). My host family was pulling really hard for me to come back to the village tomorrow. But seriously. I’m done with schoolwork tomorrow. I admit I’m a bit loathe to celebrate by going back to the village. But the jury’s still out on that. With my parents around, I’ve been able to go outside the normal PCV budget for meals, and there is some great food in Samoa! Lusia’s could easily compete with quality Asian fusion places in The States. And The Curry House is delicious (though I could have used a little more na’an.). When I travel to New Zealand next week, the Peace Corps wants me to bring Tamiflu with me on the off chance I develop flu-like symptoms. On the off chance that my flu-like symptoms are H1N1 flu. Also, all travelers entering Samoa are having their temperature taken in an effort to make sure that H1N1 flu stays out of Samoa. And with good reason. Back in the early 1900s, Spanish Flu killed of 20% of Samoa’s total population (American Samoa closed its borders during the Spanish Flu outbreak. No instances of the disease were recorded.). 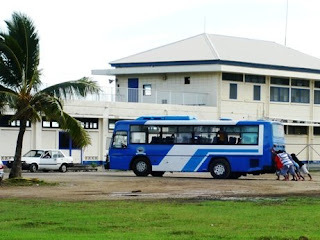 In addition to having no Swine Flu, Samoa also has no rabies. And very little (if any) malaria. Group 81 will be on the south side of the island Monday through Thursday of next week, so I expect not to post during that time. And since most of you don’t check the blog until the day after I post, you shouldn’t expect new content until Friday. But by then, I should have a full rundown on the week’s happenings. Untill then, apologies all around. That’s all I got! I hope you are carrying your own Tamiflu equivalent! Pictures below. 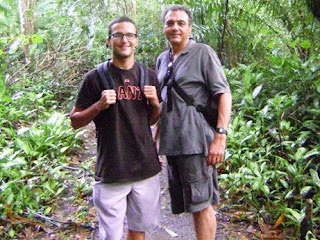 My dad and me getting ready to hike up the mountain to Robert Louis Stevenson's grave. 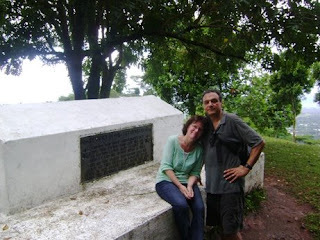 Patty and Joe at RLS's grave. 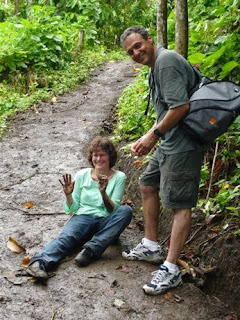 Patty and Joe taking a rest while hiking down from RLS's grave. My dad took this picture on Monday of a bunch of soles pushing a bus to get it started. They actually succeeded shortly after this picture was taken.